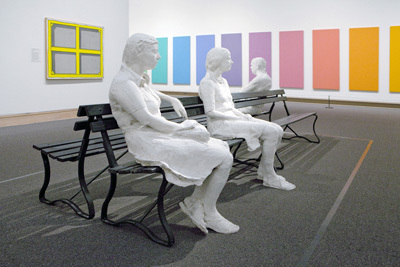 At left, George Segal's world-renowned sculpture, "Three People on Four Benches," gifted to and displayed at the Metropolitan Museum of Art. George Segal created this piece from plaster, wood, and metal in 1979. Over a half a century, George Segal created thousands of pieces of art, including sculpture, paintings, and drawings. The world embraced his art with open arms, and you can now find Segal's work in displays all over the world. On this page, we list the works you'll find in North and South America. You'll also find collections in Europe & The Middle East, Japan & Korea, as well as Bronze Sculptures on Permanent Display in several countries. Hirshhorn Museum & Sculpture Garden, Smithsonian Institution, Washington D.C.
National Museum of American Art, Smithsonian Institution, Washington D.C.